Air101: It takes £229 to Tango! It takes £229 to Tango! Just ahead of the 1st anniversary of low-cost long-haul specialist airline Norwegian’s first route to South America on 14th February, the airline has launched special celebratory fares to Buenos Aires from £229.90 one-way. The year-round service from London Gatwick to Buenos Aires Ezeiza International Airport broke the monopoly on direct flights to Argentina last year. Despite recent turbulence Norwegian, is still a popular airline, voted the World’s Best Low-Cost Long-Haul Airline by Skytrax, is offering passengers the chance to experience the ‘Paris of South America’ from just £439 return this Valentine’s Day. The celebratory offer is valid on flights from 26th February to 31st May 2019 when booked before 22.59 18th February 2019. Customers can book now at www.norwegian.com/uk. For passengers looking to enjoy an enhanced travel experience at great value to Buenos Aires, Norwegian is also extending its celebration to the Premium cabin, offering fares from £520 one-way. Premium offers spacious seating with more than a metre of legroom, three-course meal service and two pieces of checked luggage up to 20kg each, all onboard brand-new Boeing 787 Dreamliner aircraft. Matthew Wood, SVP Commercial at Norwegian said: “We are delighted to mark our first anniversary of flying to South America with the launch of a special celebratory fare. Passengers can take advantage of flying to Buenos Aires from just £229.90 one-way in economy and £520 one-way in our Premium cabin. This fantastic offer will allow holidaymakers and business travellers to enjoy our lowest fares to Argentina, all while flying in comfort on one of the youngest and greenest fleets in the industry”. Following the popularity of the Buenos Aires route, which launched with four weekly flights, the airline increased it to a daily service in December, offering passengers more choice and flexibility when travelling with Norwegian to South America. Norwegian has also made travelling onward from Buenos Aires across Argentina easier and more affordable than ever before thanks to the launch of six domestic routes. The new flights connect Buenos Aires with Córdoba, Mendoza, Iguazú, Bariloche, Neuquén and Salta with fares from £35 one-way. 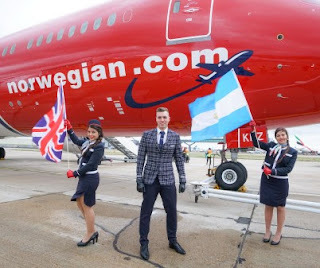 Passengers travelling on Norwegian’s route from London Gatwick to Buenos Aires Ezeiza International Airport can take advantage of the new flights departing from the city’s domestic airport which is a short taxi or bus transfer away. The domestic routes in Argentina are operated by a modern and efficient fleet of Boeing 737-800 aircraft. Later this year the airline will increase its South America presence even further as it launches the UK’s first low-fare flights to Brazil with a brand-new nonstop service from London Gatwick to Rio de Janeiro with fares from £199.90 one way. Norwegian carries around 6 million UK passengers each year to over 30 global destinations. The airline has one of the youngest aircraft fleets in the world with an average age of 3.8 years. Norwegian was awarded the ‘World's best low-cost long-haul airline’ for the third consecutive year at the SkyTrax World Airline Awards.